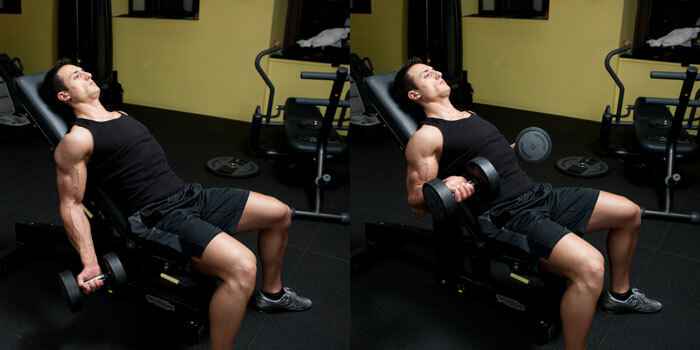 The incline dumbbell curl is great isolation movement for biceps. It works the biceps muscle from stretched position which puts the emphasis on the long (outer) head of the biceps. It gives a great stretch and good peak contraction if it’s performed properly. Prepare for the exercise by first set an adjustable bench between 45-60 degrees. Choose a pair of dumbbells and grasp one in each hand. Sit on the bench and lay back until your back and head are flat on the bench. Keep your feet firmly on the floor. Your hands should be in one line with shoulders hanging out straight to the floor. Your palms should look forward and you have to keep your elbows slightly flexed. This is the starting position. As you keep your elbows stationary curl the dumbbells up by flexing your biceps. Don’t stop the curl until you reach maximal contraction and your own biceps is stopping the movement. Hold the contraction for a second and slowly lower the dumbbell at the same path. Inhale at the starting position and exhale during the contraction at the top. Perform the desired amount of reps.
Keep your shoulders back and arms in one line with them – perpendicular to the floor. Don’t allow your elbows to move forward during the exercise because this will involve the front deltoid and lower the work of the biceps. Keep your wrists slightly backward and turn them outward during the movement so that the pinkie is higher than the other fingers. This is technique used by 7 – times mr. Olympia Arnold Schwarzenegger for maximizing the tension on the biceps at top of the movement and stronger peak contraction.